About Our Mobile Site View - "Palmy Weather Mobile Console"
Palmy Weather offers a mobile version of its website for those on the go, we call it the "Palmy Weather Mobile Console". This is a great way to keep up to date with the latest weather activities while out and about in Palmerston North on any mobile or portable device. This mobile version of the website provides the key information in an easy to view way. Simply click on the drop down box you which to view and the data is displayed; all on a single page. 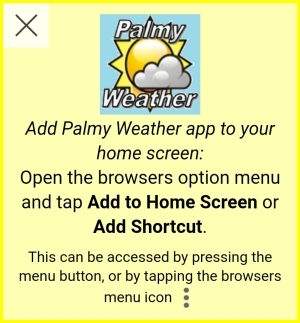 Our Palmy Weather website is set up to automatically detect mobile devices when you visit our site, but you can also access our mobile version by visiting http://m.palmyweather.co.nz from any mobile web browser. When you next visit our mobile site, why not bookmark it for quick access or save the app to your mobile device.